I know it's terribly complicated, and very inobvious, but don't panic guys, it won't wash away testosterone! 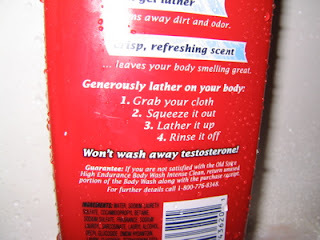 Aahhh, so they've begun attract the demographic of men who habitually stay away from the words "body wash" because of their once girly connotation. Remember when men's body wash was just a Bath & Body Works phenomenon and girlfriends just bought the masculine blue bottled products as stocking stuffers for their men? Steph, to even further penetrate body wash beyond even the metrosexual male, they are going to be releasing "Git-Er-Dun Body Wash". "For when a bar of soap just takes too long". Ha ha Peter. That's hilarious. I actually saw my brother's bottle of Old Spice body wash at my parents' house this weekend and I enjoyed a chuckle over it in the shower. I didn't use it though. In fact, in an effort to wash away testosterone, I used my mother's pink shimmering Caress body wash. In the words of Sarah Jessica Parker, "I enjoy being a girl." OMG--Julie, you seriously have me LOL-ing!!! You've tied so many great things into a remarkably short post! I find "shower chuckles" to be SO hilarious because when you're in the shower, everything reverberates and people can hear you laughing, but they know that you at least SHOULD be alone, so it makes it all the funnier! One time my loofah (or fluffer-nutter as Peter calls it) fell apart in the shower and was seriously one long string of "loof." I was LOL-ing, and Matt and Peter were more than a little disturbed.